wear was not to be an issue after a heavy crash for CIP rider Alan Techer saw the second Moto3 round in a row red-flagged. Vinales had taken the lead by the time of the accident and was awarded first for Team Calvo ahead of a frustrated Luis Salom, who had broken away with his fellow Spaniard after Estrella Galicia rider Alex Rins fell earlier in the race, and had been waiting for the right moment to make a break for the front aboard his Red Bull Ajo KTM. Mapfre Aspar rider Jonas Folger was the first rider not of Spanish origin to grace the podium this season, though the rostrum remained an all KTM affair. Vinales now leads the championship by four points from Salom. Initial reports confirmed Techer to be conscious and have no breaks but was stuggling with his memory of the event. The top finishing Honda was Brad Binder for the Ambrogio team, he had a huge gap when both Mahindra’s Miguel Oliveira and Caretta’s Jack Miller crashed while racing just behind him. Fifth went to Jakub Kornfeil for RW Racing despite only arriving on Saturday as he had exam commitments in the Czech republic.Brit John McPhee narrowly missed out on his first top ten finish, having taken the position from Alexis Masbou he only missed out when the race was taken back to the last full lap for the result. Fellow countryman Danny Webb wasn’t far behind, securing a twelfth place finish for the Ambrogio Racing team. Jasper Iwema returned after being the rider whose crash ended the Austin round with a red flag for 14th. Sixteen year old Livio Loi scored a point on his debut ride for Marc VDS, previously he had not met the minimum age to race. 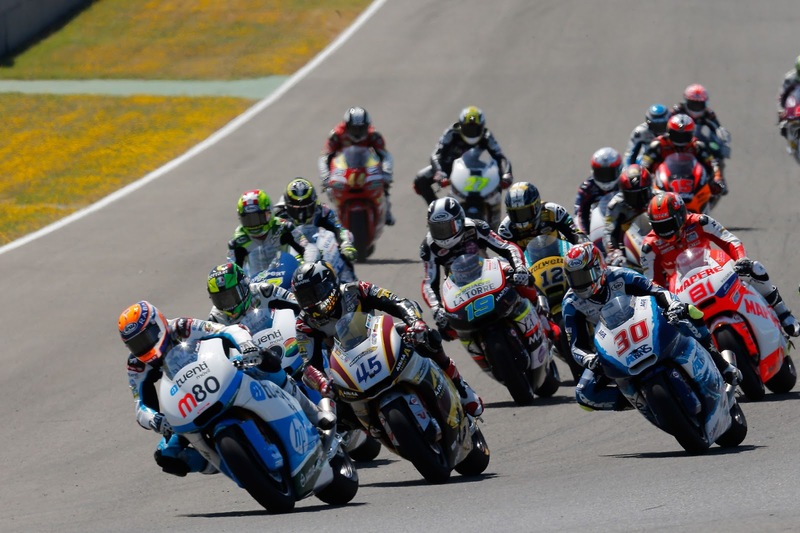 Moto2 was dominated by Tito Rabat, the Tuenti HP 40 Pons rider leading from the lights to the chequered pole in his 113th race start. The pole-sitter pulled away from an equally solo Scott Redding who in his own words was “on the limit” as he said in parc ferme trying to keep up. The Gloucester man rode maturely with consistant lap times to finish easily ahead of Rabat’s team-mate Pol Espargaro. Espargaro provided the main racing action as he caught and passed Italtrans rider Takaaki Nakagami, managing the feat twice after Sucipto let the Japanese rider through when being lapped but held the Pons man up The first four positions were filled by Kalex machines with Austin winner Nico Terol the first Suter to cross the line for Mapfre Aspar. Other finishers of note include Tom Luthi, who finished 11th on his first full race weekend following his testing injury for Interwetten and Top Speed Up rider QMMF’s Ant West who took 12th. British Riders Kyle Smith and Danny Kent both had offs over the race duration. Tech3’s Kent registered a 27th place finished with Blusens racer Smith suffering a DNF.